Lake Kariba is the world’s largest man-made dam by volume, extending over 5000km2 along Zambia’s southern border. Completed in 1959, the dam provides hydro-electric power to both Zambia and Zimbabwe, and fish stocks – mainly tilapia, kapenta and the prized tigerfish – are also shared. Access to the Zambian side the lake is fairly limited, with Sinazongwe or Siavonga the only two towns of any significance. Siavonga is the larger, a sleepy lakeside holiday village that’s popular with locals and only a few hours’ drive from Lusaka. Sinazongwe is much smaller and less developed, and most head to Siavonga as their base for exploring the lake. The Zambian side of the lake is far less wild compared with Zimbabwe and there are no game reserves anywhere along the northern shore. For wildlife, you’ll have to visit one of two large islands, Chete or Chikanka, both in the southwest and accessible from Sinazongwe. Chete is the larger of the two and guided game walks are possible. There’s a small population of elephants, some leopards and plenty of crocodiles, hippos and birds. Chikanka is privately owned, with a single, dedicated fishing lodge. 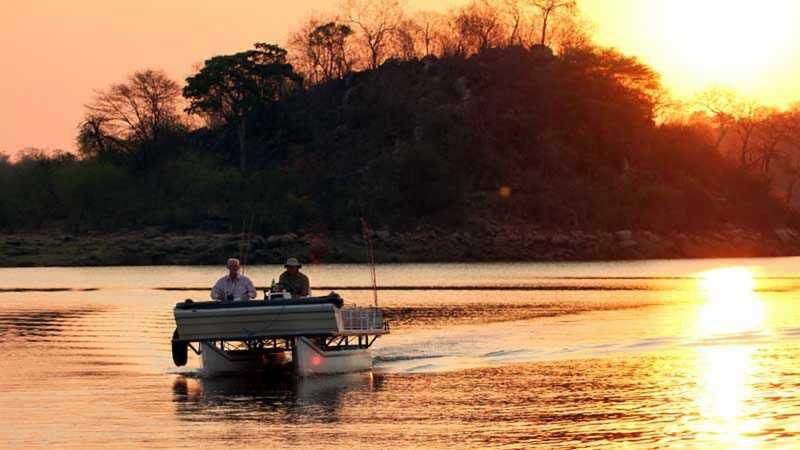 It’s one of many fishing options on Lake Kariba, with tigerfish the most sought-after catch. Various expeditions can be arranged from Siavonga – from live-aboard houseboats to private motorboat trips and canoes. Siavonga is also right next to the dam wall and by flashing your passport you can walk out onto it, or catch a boat from Siavonga for a dam-wall cruise. It’s not safe to swim along Lake Kariba’s shallow shoreline, both due to the waterborne parasite bilharzia, and the high numbers of crocodiles and hippos. It’s generally okay to swim further out in deeper water so a quick dip from your house boat is usually fine. There are good roads to both Siavonga and Sinazongwe, but Siavonga is easier to reach as it’s closer to Lusaka. Any visit to Lake Kariba is largely about houseboats and/or fishing so if you’re not into either then you might want to look elsewhere. If it’s boating and fishing you’re after then you can’t go wrong. There are hotels, lodges and campsites in Siavonga to suit a range of budgets and whereas fishing is banned on Zambia’s rivers from December to March, Lake Kariba is exempt, with fishing year-round.